Don’t worry about it. You’re doing fine. It was my holiday gift from my older kid. A magnificent, weighty mug with words on it. Words that my kid, along with perhaps many other people, thought I needed to hear and know right now. Words I think that maybe many, if not all, of us need to hear and know right now. I will admit that, most likely, the pressure is self-imposed. Of course, it’s self-imposed. That doesn’t make it feel any less pressure-y. That doesn’t make it any quieter when it’s shouting in my head. There is pressure to be my best self – whatever the hell that is. Again, it’s self-imposed. Again, it’s a deeply ingrained impulse that drives me incessantly. Until I read my mug. “DON’T WORRY ABOUT IT” it tells me, “YOU’RE DOING FINE” and I decide that I’m fine just how I am. My mug says so. It must be true. I can let it be. I can let me be. I can say “f—k it” and chill. Not everyone is wired as tightly as I am, I’m sure, but many people are wired more tightly than they need to be. Not everyone had these impulses ingrained in their brains by their childhood in a cult, but I’ve met (and coached) more people than I care to admit who have deeply ingrained impulses very similar to mine. 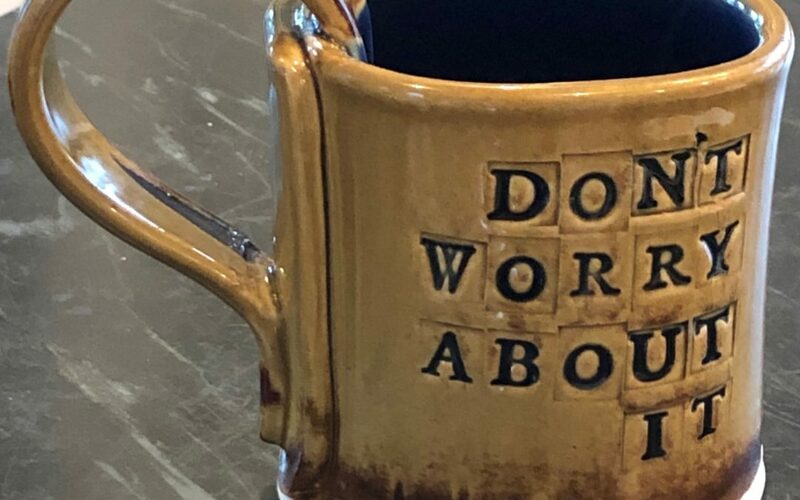 To all of us I say, “DON’T WORRY ABOUT IT – YOU’RE DOING FINE.” I offer the words that my kid gave me, the words that I’m currently using to breathe down my anxiety and ease my self-imposed pressure, the words I read – over and over if necessary – on my mug.